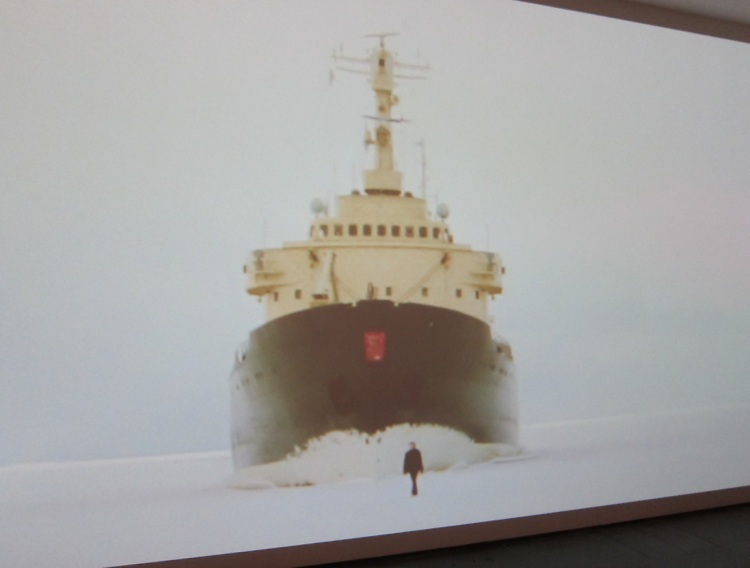 In this video, on MoMA’s first floor by the escalators, a person is walking faster than an ice-cutting ship. It’s ten minutes of calm and a little suspense. 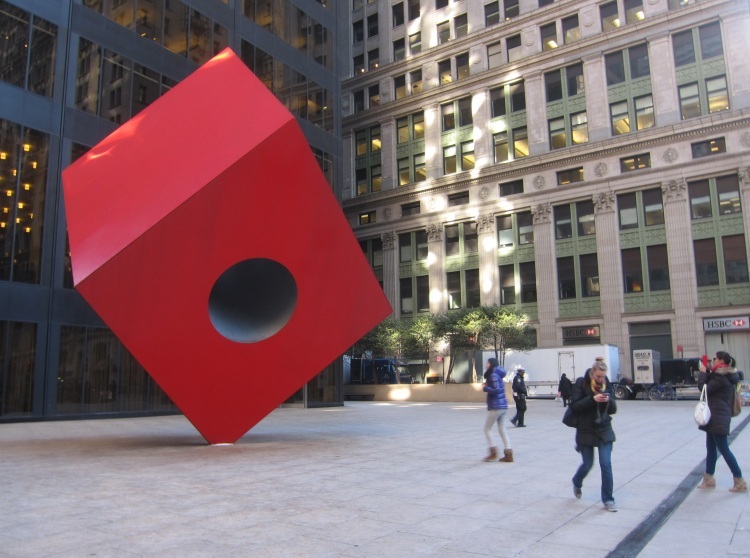 It was almost two years ago that I featured Noguchi’s red cube on the blog. Tourists were posing in front of the sculpture yesterday. Good public art is like running into a friend on the street; it’s a happy occurrence. 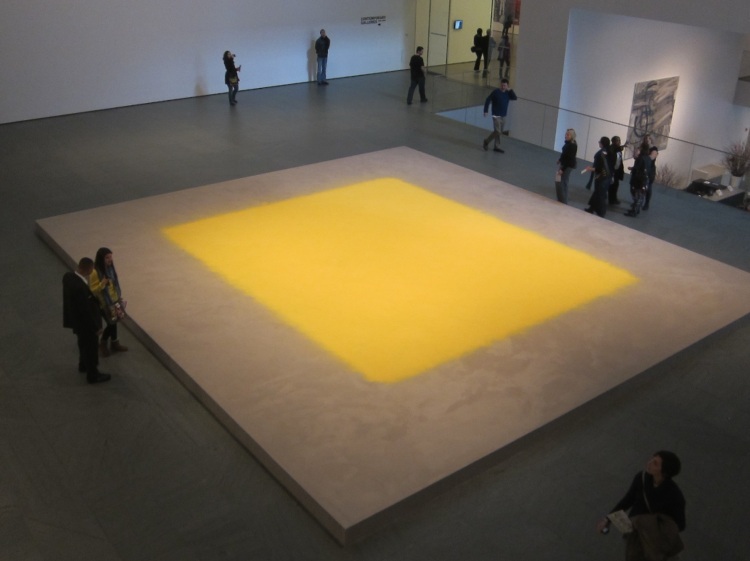 Wolfgang Laib’s “Pollen From Hazelnut” is a huge rectangle of pollen that was meticulously sifted onto a platform in MoMA’s second floor atrium. From a distance it appears slightly convex and resembles a pincushion, or a minimalist painting too large to hang. Up close, the yellow of the pollen is compelling but not overwhelming – I’m glad I saw it but I haven’t advised friends to rush over. The pollen’s on view until March 11. 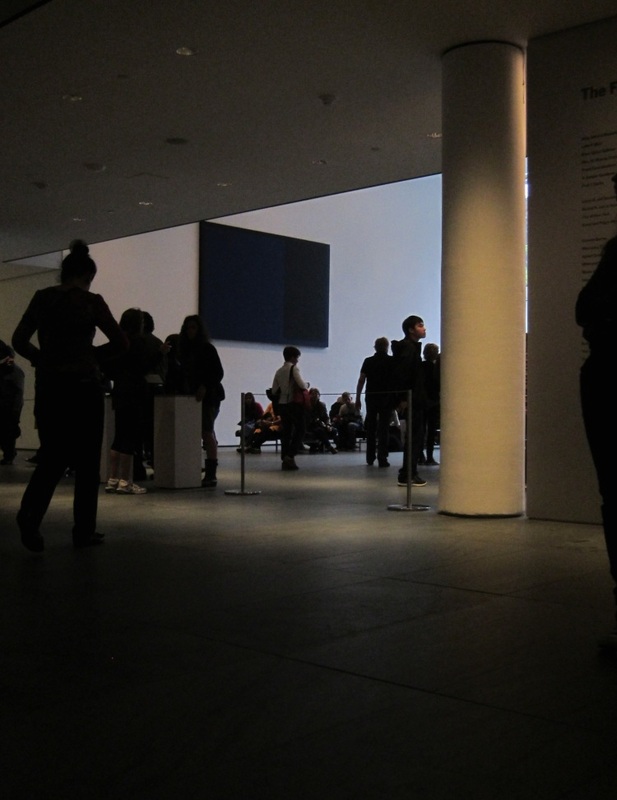 Nearly closing time at MoMA, and people are still in line to see Christian Marclay’s “The Clock.” The “cinematic tour de force” has a cult following, and predictable lines. In the second floor atrium, Philip Worthington’s “Shadow Monsters” provides entertainment. The wall projections are interesting, though I had expected something else, after seeing pictures at moma.org. There’s an exhibit about the Lion King show that is set up for a few weeks in a space across from Bryant Park at the corner of 42nd and 6th Avenue. Check out the costumes and the puppet-creatures from this blockbuster… for free! Japanese artist Tatzu Nishi has re-imagined the Columbus Circle statue as the centerpiece of a living room. Visitors climb stairs to reach the installation seventy-five feet in the air. The 13-foot-tall marble statue of Christopher Columbus dominates the tasteful living room (with funky pop art wallpaper); windows and magnificent views remind the crowd where they are. The piece is only up through this weekend. String together some words and you have poetry, or an instant holiday gift. 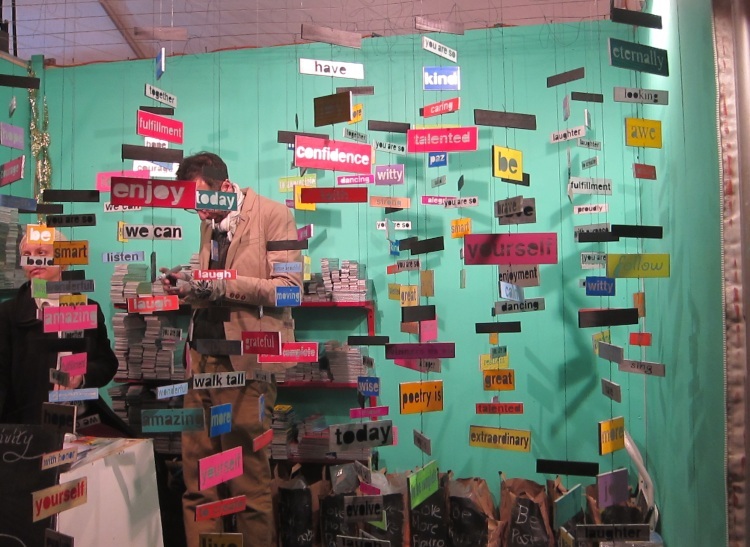 Visually, this was one of my favorite booths at the Union Square craft thing. It was like words floating in a big fishbowl. This was yesterday; MoMA’s closed on Tuesdays. I think I’ll remember because I tried to go there two weeks ago and found it shut. The lobby is usually open, though, in case you want to cut through or peruse the gift shop. 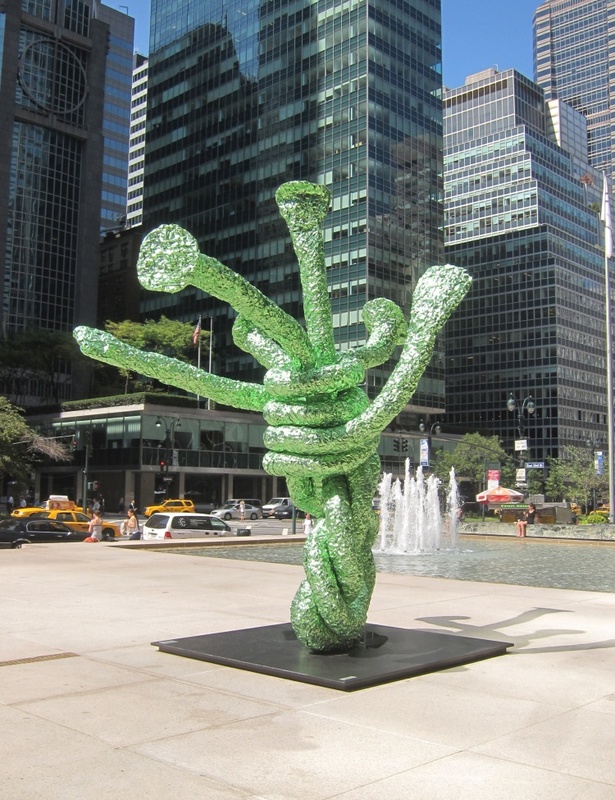 “Mermaidsmischief,” done in 2009, won’t go down as one of John Chamberlain’s best sculptures, but it, along with other pieces on the Park Avenue plaza of the Seagram Building, are worth a visit. The artist twisted pieces of aluminum foil and these were blown up to a grand scale. The sculptures, up to 15 feet tall, are best viewed from a distance. Up close, the urge to touch the familiar-seeming surface is almost overwhelming. 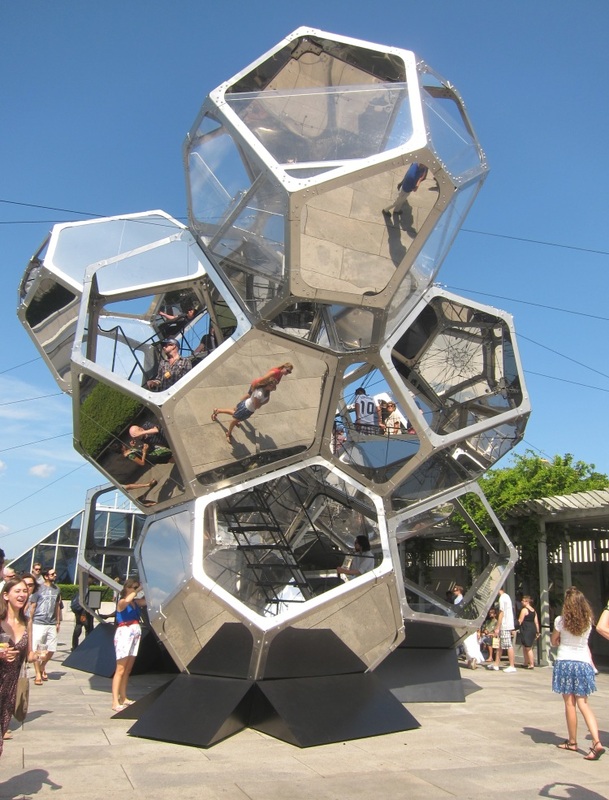 On the Met’s roof there’s a large modular sculpture by Tomas Saraceno. Get a ticket and you can climb inside, enjoy the view of Central Park.